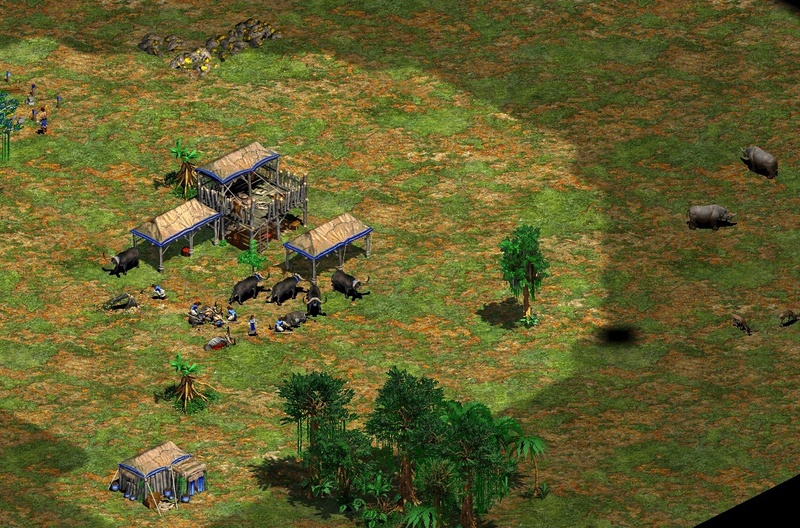 As I mentioned in the previous month in review post, I have been playing some Age of Empires II: The Age of Kings recently. In part that has been because it is an easy game to fall back on. I have a long history with it and it is one of the best RTS games I’ve played. It is well balanced and the AI can be pretty good. Finding myself without a burning interest in much else besides EVE Online of late, it is pretty natural that I end up here. There as also a bit of achievement farming driving my return. I don’t generally chase achievements on Steam unless I am really into a game (like Defense Grid for example). But I was looking at the list for Age of Kings and had to ask myself things like, “Have I really never won against the Spanish?” So I started using that as a guide for who I should face. But mostly I am back because a few weeks ago I got a notice that the expansions for the game were on sale, so I decided to pick them up. There are now three expansions for the game available on Steam. These are all recent expansions, as the original 2000 expansion for the game, The Conquerors, comes with the base game now. I actually already owned the first expansion, The Forgotten, but hadn’t had a lot of time with it. But I picked up The African Kingdoms and Rise of the Rajas, which add empires from Africa and Southeast Asia. I have to say I am actually pretty impressed with these expansions. Even at their normal price of $10 they deliver quite a bit of content. The all include four new empires to play, with structure graphic to go along with their themes. I immediately gravitate to that. But they also come with some new technologies, new units, new map types, new game modes, and four full on campaigns to play through. I’ve always gone straight to the skirmish mode against the AI or friends, but with a dozen new campaigns to hand I might have to start exploring that aspect of the game. Meanwhile, I have to say that the additions to the game are pretty good. The new map types comes with their own biome, so rather than sheep you might have some other livestock to harvest right off. Everybody starts with the same Dark Age buildings, but once you get to the Feudal Age and beyond the buildings in the new expansions reflect the various civilizations. The new map types have some interesting ideas. Pictured above is the mangrove swamp map, which limits you to a modest patch of land. The rest of the map is shallow swamp and trees. You cannot build on the swamp, so you have to manage and hold your starting spot. Also, additional gold and stone harvest spots, as well as all the relics, are located within the trees so you have to harvest your way to them or use a siege engine to tear out a path. This would be an interesting map to use against other players. It certainly eliminates the whole “hide a villager and build a town center in some corner of the map” aspect of the game. You have to stand and fight because you can’t build elsewhere. On the other hand, this was a map style that the AI wasn’t able to handle. 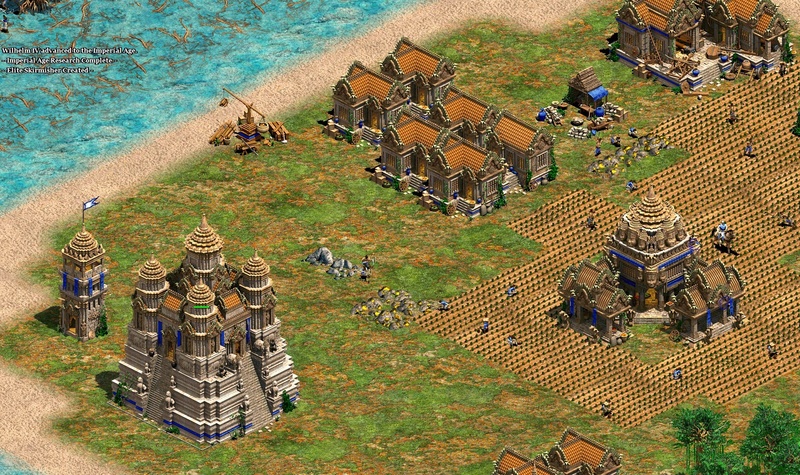 After repulsing the first attack from the AI and battling it again mid path, I arrived in the AI town to find all the villagers standing around idle. The AI had harvested up everything on the land patch, used up those resources, and then stopped. I suspect that the AI has something in it about being efficient, so it won’t harvest wood or mine unless it has a resource collection building close to hand. However, since you cannot build on the water your villagers have to cross a fairly wide gap to start in on the trees around your land patch. So despite the fact that the AI was surrounded by woods and had two exposed gold patches nearby, it ignored them as unharvestable. Still, I have been enjoying some time back with Age of Kings, a game that launched back in 1999. Thanks to the HD update, which itself is now past the five year mark, it is still very much playable and enjoyable after all this time. Meanwhile I haven’t really heard anything about Age of Empires Definitive Edition that Microsoft was touting about a year back. It was supposed to be out on February 20th of this year, a date that came and went without me noticing even a peep. I haven’t seen any news and since I cannot even purchase it, not having Windows 10, I cannot tell how things went. I guess it launched, according to Wikipedia, but didn’t make much of a splash. That’s what making it a Microsoft Store exclusive gets you I guess. 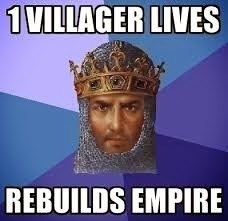 Likewise, the hype around the otherwise vaguely described Age of Empires IV seems to have dissipated as no further news about it has popped up anywhere that I have seen. So I guess I will stick with what I have. This entry was posted in entertainment, Other PC Games, Steam and tagged Age of Empires II, Age of Kings, Rise of the Rajas, The African Kingdoms, The Forgotten on May 15, 2018 by Wilhelm Arcturus. Meanwhile, I did the observation on a map with three AI opponents and found that two of them did the same thing, gave up after they exhausted the resources on their starting patch. However, the third AI seemed fine harvesting elsewhere and actually put up a good fight, attacking my base and coming to defend the other two AIs, as they were all allied, when I sent out forces to clean them up. It was in observing the third AI that I discovered you could build on the deforested space, so now I really don’t know why the other two AI opponents, or the AI from the previous game, just gave up.